I’m the first to say that advent calendars are so fun! I mean you’re waiting for a special day and you get to countdown by opening and getting a little treat on each day that you countdown, that’s a win win! Last year my mom got the kids a lego advent calendar and they really enjoyed it. But this year I was thinking of something a little different. A Kindness Advent Calendar. I should probably let you know that we are only doing a 13 day Kindness Advent Calendar. The reason being is that although we do enjoy the holiday season and we put up a tree, we don’t actually celebrate Christmas. However, we do have a special occasion we celebrate on December 13th, hence a 13 day advent calendar. (But I will share more than 13 ideas so that you’ll have more than enough to fill a 25-day Kindness Advent Calendar. The reason I decided to go for a kindness advent calendar this year is that I wanted to take the focus away from things and stuff. The kids will be getting a present from us and from their grandparents, so I thought for the advent calendar, it would be nice to focus on being kind and doing things for others. 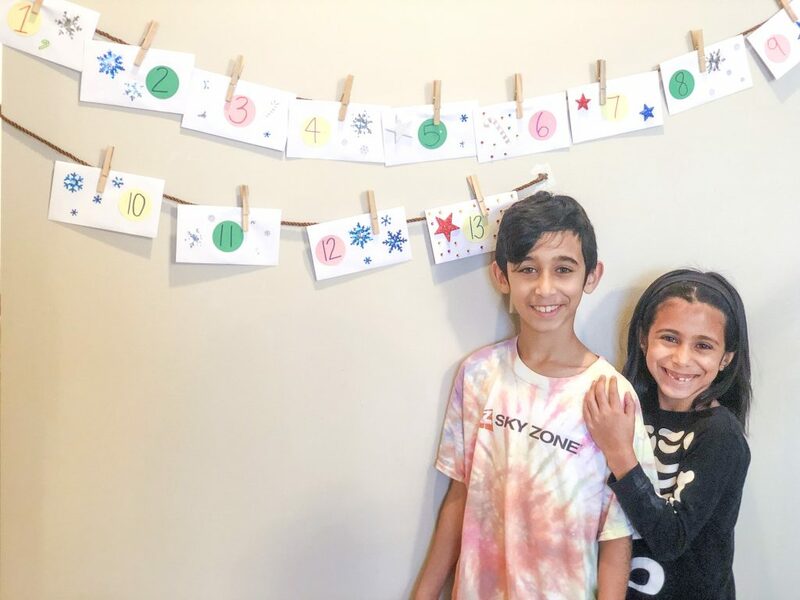 I made a very basic DIY Kindness Advent Calendar. I took plain white envelopes. On the envelopes, I wrote the numbers/date. Then I decorated the envelopes with festive winter and holiday stickers. Then on some scrap paper, I wrote the different acts of kindness for the kids to do. I took into account what day of the week it was and if they had any activities. That way the more involved ones could be on the weekend or a less busy day etc. After that I took some thick string and clothes pins I’d bought from the dollar store and hung the calendar on the wall. It was really that simple. – Go through your toys (or clothes or books) and donate what you don’t need to those who might need them. Those are some of my favourite ideas for a homemade kindness advent calendar. 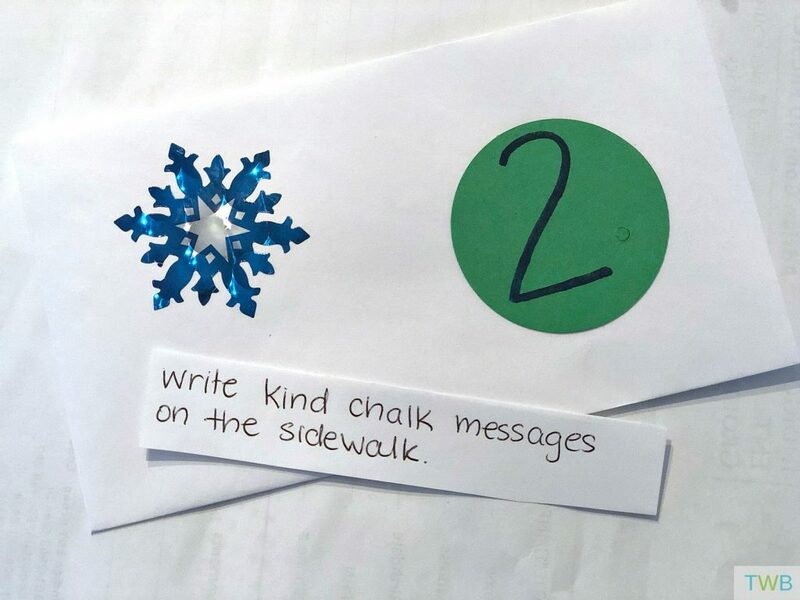 For those of you who are using calendar that already had treats, one idea would be to write out little kindness ideas and then put them in each day. That way when your kids open the calendar each day, they have a treat and an act of kindness to do! Love this post and ideas, Salma. Definitely inspired me to make a calendar of my own! Thank you Farah and I hope it went well!